Wow, this Holy Horse Hair Vessel is a truly beautiful piece. Rich earthy hues of red, cream, and burgundy tones combine with the classic horsehair effects and a touch of copper to provide a beautifully formed work of art full of texture and character. This piece measures approximately 10″ in height, and 7″ in diameter at its widest point. 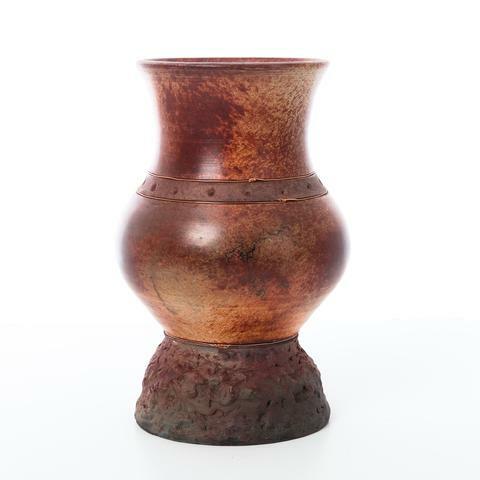 This gorgeous vessel is an example of his work using the horse-hair raku technique, a centuries-old Japanese firing technique which, through unique finishing processes and artistic skill, produces individual works of art that are truly one of a kind. Piece measures approximately 10″ high, 7″ in diameter, and could be a functional vase or a stand-alone display piece.